by Geoffrey Ciani – The term Klitschko Dream typically refers to the goal of brothers Wladimir and Vitali Klitschko to simultaneously hold all of the major world titles in heavyweight boxing. Mission accomplished! Wladimir now holds belts from three of the four main sanctioning bodies, while Vitali carries the fourth. This is an amazing feat. In fact, for the better part of the last eight years either one or both of the brothers has reigned supreme. Despite this impressive display of dominance, however, the Klitschko brothers remain largely unappreciated as heavyweight commodities, particularly in the US. Why is this? Many observers viewed the Klitschko Dream as nothing more than a pipe dream back at the time when the two brothers both turned professional in November 1996. After all, the heavyweight landscape during this period had a great deal of depth and talent. Initially Wladimir was viewed as the more promising of the two brothers, largely because he captured the Gold Medal at the 1996 Olympics in Atlanta. The overall early perception of the Klitschkos was a mixed bag. They were obviously big and strong, but often described as being robotic and uncoordinated. Plenty of question marks surrounded the two of them as they slowly worked their way up through the professional ranks. Vitali would soon be seen as the better of the brothers following Wladimir’s shocking loss at the hands of Ross Purity in December 1998, which was just over two short years after the Klitschkos debuted. Wladimir’s loss to Purity had more to do with inexperience and poor pacing than anything else. Eager to put on an impressive performance while fighting for the first time in front of his hometown audience in Kiev, Wladimir simply punched himself out against a durable opponent, which allowed Purity to capitalize on Wlad’s physically and mentally exhausted state. While Wladimir was forced to regroup and slowly rebuild, Vitali started making a bigger name for himself when he made easy work of Herbie Hide in June 1999 to capture the WBO championship. Now at the time the WBO was not as highly regarded as it is now, but the impressive nature of the victory still put the boxing world on notice. After having two successful title defenses against Ed Mahone and Obed Sullivan, Vitali was slated to face Razor Ruddock, who was attempting a comeback of sorts. Unfortunately for Vitali, Ruddock was forced to pull out of the contest due to a hepatitis infection. Instead, on just a week’s notice, Chris Byrd stepped in as a last minute replacement. Byrd of course would beat Vitali Klitschko, and this remains a hot topic of discussion among boxing fans to this very day. Klitschko had a commanding lead on the official cards, but he suffered a torn rotator cuff and was forced to retire on his stool after nine rounds. Byrd was coming on strong as the fight progressed, even occasionally forcing the much bigger man to retreat. But Byrd still would have at least needed a couple of knock downs over the final three rounds just to secure a draw in all likelihood. The focus of this fight in the aftermath became the injury itself. Some would argue that Vitali had just three more rounds to go, and that he should have tried to see it through. Others maintain that Vitali did the smart thing and that prolonging the fight could have further aggravated the injury and perhaps even jeopardized his career. The end result was that Vitali would become plagued with the dreaded “quitter” label. At this point in time, April 2000, the Klitschko Dream was as good as dead. Wladimir had succumbed to exhaustion against an unheralded journeyman and Vitali had quit on his stool against a much smaller man. The idea that either of these men could pose a real challenge to reigning undisputed king, Lennox Lewis, seemed extremely farfetched. Of course, this is boxing, so the idea that one of them could potentially rebound and earn himself a title belt was certainly in the realm of possibility. But the idea that both could simultaneously call themselves champions—and the only champions—in heavyweight boxing appeared very remote. Byrd was contractually obligated to defend his new title against Wladimir, and six months after Byrd beat Vitali, the fight between Wladimir and Byrd was on. It was a stylistic nightmare for Byrd. Wladimir dominated the action from start to finish, and battered Byrd all around the ring, dropping him twice along the way en route to a lopsided unanimous decision victory. The WBO belt would once again find itself in the hands of a Klitschko, and Wladimir managed to resurrect his career and avenge the loss of his brother. This would mark the first ‘Revenge of the Brother’ moment for the Klitschko brothers and, with the win, the 1996 Gold Medalist was once again being viewed as the superior brother. Wladimir would successfully defend the WBO title five times. This string of progressively more impressive victories came against the likes of Derrick Jefferson, Charles Shufford, Frans Botha, Ray Mercer, and Jameel McCline. At this point in time Wladimir was being touted by HBO as a highly regarded talent and possible future challenger for Lennox Lewis. In fact, Wladimir and Lennox even worked together on set for the filming of Ocean’s Eleven, which was shot just before Lewis’ two fights with Rahman. Meanwhile, Vitali was rebuilding and had successfully bounced back from the Byrd loss with five consecutive victories of his own, including an eleventh round stoppage victory against Purity in another ‘Revenge of the Brother’ scenario. 2003 would become a pivotal year for the Klitschkos. It all started in March when Wlad was pitted against southpaw Corrie Sanders. The younger Klitschko was expected to make easy work of Sanders in a bout that was intended to showcase his talents to create demand for a showdown with Lennox. Unfortunately for Wladimir, Sanders had other plans. Corrie had exceptionally fast hands and explosive power. Out of his awkward southpaw stance, Sanders’ left hand was just all wrong for Wladimir! He had no defense for it. Sanders proceeded to land his power shots with ease, dropping Wladimir four times before the bout was mercilessly halted in the second. To his credit, Wladimir never stopped trying. He was just outgunned, plain and simple. This was yet another major blow to the Klitschko Dream. Question marks had already long surrounded Wladimir’s chin, and with the brutal nature of the knockout loss suffered against Sanders, many observers felt the book was now officially closed. Wladimir obviously could not take a great punch, just as many suspected. Even worse, the ease with which Sanders was able to find the mark on Wladimir left the impression that he also had major holes in his defense. The Klitschkos were once again left without a title belt, and Wladimir’s future prospects were now surrounded with a great aura of doubt. As a result, the perception of Klitschko superiority again shifted, and focus returned to Vitali. Vitali was scheduled to face Cedric Boswell in June 2003 on the undercard of a championship contest between Lennox Lewis and Kirk Johnson. Lewis and Vitali were both expected to win their respective bouts, and this would perhaps act as a prelude to a showdown between those two later that year. Fate had other plans, however. A pectoral injury suffered by Johnson forced him to pull out of his scheduled bout with Lewis. In order to save the card both Lewis and Klitscthko agreed to square off on short notice. This was a commendable action by both champion and challenger, which paid huge dividends for boxing fans. Many observers anticipated that Lewis would make quick work of Vitali. A lot of people incorrectly assumed that since Wladimir succumbed to pressure so quickly against Sanders (who reportedly took advice from Lennox regarding his approach in tactics against Wladimir), that Vitali would fall victim to Lewis in similar fashion. Things did not play out that way. Instead, Vitali came to fight and actually rocked the champion early in the contest with some crushing right hands. What ensued was a measured war that became a battle of attrition between two determined warriors, each looking to inflict some serious damage on the other. A gruesome cut over Vitali’s eye ultimately caused the ringside doctor to call a halt to the bout, and now the simple phrase “TKO6” will forever hold a special meaning for boxing junkies. Fans can, and still do, speculate as to what may have happen had Vitali been allowed to go another round. Regardless of what might have been, Vitali had secured his spot as the top Klitschko and also redeemed himself for choosing not to continue against Byrd. He exhibited a degree of toughness and resilience never before displayed by Wladimir. While Vitali was out there giving the recognized champion all he could handle, Wladimir had been bludgeoned by a past-prime fringe contender who had never reached his full potential. In the span of about three and a half months, Wlad’s stock had plummeted whereas Vitali was symbolically being referred to as “the people’s champion”. In December 2003 Vitali wound up having to square off in a title eliminator bout against Kirk Johnson in order to become the mandatory for Lennox. In what was perhaps the greatest performance in his career, Vitali scored a superb stoppage as he just overpowered Johnson in a crowd pleasing attack. This would make Vitali the mandatory for Lewis, but Lennox retired instead. So rather than a highly anticipated rematch with Lewis, Vitali was then ordered to have a bout against Corrie Sanders for the vacant WBC strap in yet another ‘Revenge of the Brother’ angle. Sanders vacated his WBO title to get this opportunity. But two weeks before Vitali got his crack at the vacant WBC belt, Wladimir was going to get another chance at Sanders’ recently vacated WBO title. On April 10, Wladimir faced Lamon Brewster for this recognition. The thing that was most significant going into this bout was the fact that Wladimir was teamed up with Hall of Fame trainer Emanuel Steward for the very first time. Steward had always been impressed with Wladimir’s talents, and Emanuel also had a knack for fine-tuning the styles of bigger heavyweights, like Lennox Lewis. It seemed like a perfect fit. Unfortunately for Wladimir and Steward, their first effort together ended disastrously. Brewster stopped Wladimir after five rounds of action in a bout Klitschko had been dominating. At this point in time the Klitschko Dream was again on life support. While Vitali was widely regarded as the best in the division following Lewis’ retirement, Wladimir just did not appear to have the mental makeup of a champion. Losses against Purity, Sanders, and Brewster hung around Wladimir’s neck like an albatross. Meanwhile Vitali was on top of the world, especially when, just two weeks after his brother lost to Brewster, he took care of business and avenged his brother’s other loss to Sanders. With that victory Vitali became the WBC heavyweight world champion, and it was back to the drawing board for his younger brother who had now last two of his last four. Vitali would only defend his title one time against Danny Williams. He was then forced to retire after a series of injuries interfered with three different scheduled defenses of his WBC belt against Hasim Rahman. Vitali’s body just could not handle the continued wear and tear, and he announced his retirement in December 2005, noting, “Lately, I have been spending more time with my injuries than with my opponents inside the ring”. With Vitali’s retirement, the Klitschko Dream was no more. Wladimir, however, was just beginning to get his career back on track! Following the loss to Brewster, Wladimir and Steward regrouped with a pair of victories against DaVarryl Williamson and Eliseo Castillo. The unsatisfactory technical decision victory against Williamson ensured that questions would continue to surround Wladimir with regards to his chin, his defense, and his mental toughness. He would truly be put to the test when he was pitted against hard punching Nigerian, Sam Peter, who was 24-0 with 21 wins coming by way of knockout. Wladimir dominated the majority of the action, but Peter managed to drop Wladimir three times during the course of the contest. Even with the knockdowns suffered, Wladimir persevered and easily outpointed Peter over the twelve round distance. It was a career-defining victory for Wladimir in a good disciplined effort. While things were certainly shaky, as evidenced by the multiple knockdowns, Wladimir was beginning to perfect the style adjustments that were incorporated by Steward. The victory against Peter earned Wladimir a title shot, which came in the form of a rematch against Chris Byrd, who was then the IBF champ. Once again Wladimir’s style proved Byrd’s nemesis, as Wladimir easily outclassed Byrd en route to a seventh round stoppage. Wladimir has not lost since then and has become the dominant force in the heavyweight division. He has successfully defended the IBF title 12 times, and additionally added the WBO belt when he beat Sultan Ibragimov in February 2008, and the WBA title after beating David Haye in July 2011. During that stretch, Wlad also avenged his loss to Brewster and beat Peter far more convincingly in return bouts. He rarely loses a round these days, and has outclassed every foe put in front of him. His confidence has also reached new heights, as him and Steward are working together in perfectly tuned harmony. Like a Phoenix from the ashes, the concept of the Klitschko Dream was resurrected with the unlikely return of Vitali Klitschko. Previously there had been rumored comebacks, and even a scheduled contest in 2007, but Vitali finally made his return to the ring in October 2008 to face the WBC champion, who happened to be Sam Peter. Vitali had retired nearly three years earlier, and with his history of injuries many wondered whether Vitali would survive training camp, let alone twelve rounds of grueling action against the hard-hitting Nigerian. As it turned out, Vitali made easy work of Peter, as he controlled every second of every stanza before Peter had had enough after eight rounds. Vitali regaining the WBC strap with his impressive performance against Peter marked the first time the two brothers simultaneously held portions of the heavyweight crown. But the Klitschko Dream was not technically fulfilled until July 2, 2011 when Wladimir added the WBA belt to his existing collection that also included the IBF and WBO. All four major sanctioning bodies then officially recognized a Klitschko as the reigning heavyweight champion of the world. It truly is an amazing feat, especially considering the trials and tribulations the brothers have faced and endured. There were a lot of ups and downs along the way, and there were several times during the journey where it appeared the dream was impossible. Yet they persevered and overcame. Even with their combined reign of dominance, the Klitschkos never did receive mainstream acceptance in the US. In part this is largely due to a lack of exposure. HBO was big on the Klitschko brothers at various points over the years, but they seemed to lose interest following Wladimir’s unification win against Ibragimov, which was a dull affair void of any real action. Despite both having an extremely high knockout percentage, the Klitschkos are also often criticized for their ‘boring’ styles, which largely embrace a safety first approach that involves methodically wearing opponents down, both physically and mentally, before stopping them late. Perhaps there is some correlation here, but at the same time, it would seem that there was an incredible marketing opportunity available to capitalize on the tremendous success that has been celebrated by the brothers Klitschko. Many fans view Lennox Lewis as ‘the last great heavyweight champion’, and many long for the days where Lennox reigned supreme. Some people forget, however, that during his championship run, Lennox was often perceived as ‘too cautious’ or ‘boring’, much like the Klitschkos are today. Lennox, like many before him, notably Larry Holmes, is a champion whose appreciation from the fans has grown with time. Looking back, Lewis was an amazing champion with an incredible resume during one of the most competitive eras in heavyweight history, perhaps even second best just behind the ‘Golden Era’. The Klitschkos may ultimately run a similar course, where their dominance is better put into perspective after their time has passed and gone. Additionally the Klitschko brothers suffer from the fact that, not only is the division perceived as weak and lacking in talent, but then there is the fact that the two best heavyweights in the world refuse to face each other (and not without good reason). With the lack of any big challenges out there, the Klitschko brothers have systematically disposed of everyone, and sometimes both Klitschkos have even beaten the same opponent. Between the two of them, they have defeated every man they have ever faced, with the lone exception of Lewis himself. This may forever loom over them, because neither Klitschko has a signature victory of his own. Vitali is best known for his losing effort to Lennox, and Wladimir’s signature victory probably came against Peter when everyone was doubting him. Now it is true that the competition the Klitschkos have collectively faced has not been filled with world beaters. This is nothing unique, however. Many champions who reigned previously throughout history have suffered from similar circumstances. Joe Louis had the ‘Bum of the Month’ club, and even guys like Mike Tyson, Larry Holmes, and Rocky Marciano are often criticized for the lack of available worthwhile contenders. But all we can ask of any champion in any era is that he does the best he can in terms of the circumstances put before him. At the end of the day, there is nothing more we can ask from any champion. 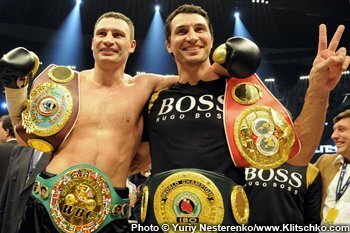 It is simply impossible for Wladimir or Vitali to face off against champions of the past. All they can do is beat the guys put before them today, and they have consistently managed to do that with the utmost success. Besides, even if the heavyweight division is currently at the absolute worst point in its history, the ease with which the Klitschkos have eliminated their opposition is noteworthy in itself. While the Klitschko Dream has been fulfilled, the Klitschko Legacy is something yet to be determined. While the end of the road draws nearer for Vitali, Wladimir can still conceivably dominate the current landscape for another three to five years if he remains healthy. Whether or not he actually does so remains to be seen, but whatever happens from this point forward, the Klitschko brothers have already successfully carved a niche for themselves in the annals of boxing history. I believe future historians will look more kindly on them than their contemporaries, but until then, we are witnessing something very unique in professional sports. Previous boxing news: De La Hoya Says Deontay Wilder Is A Heavyweight Thomas Hearns!